The question of the day at all training sessions is always, “How much honey will my hive produce?” This sounds like a logical question but there are so many factors involved that it is difficult to give an accurate answer. What was the size of your swarm when it entered the hive? What’s the quantity of nectar-bearing flowers in the area? Is there a water source present? How many pests are around and active at that site? (My hives situated over sandy soil always struggle more with pests than hives situated over clay soils due to many of the beetles that breed in sandy soil). Catching swarms is the only available way for most African beekeepers to increase the number of colonies they have. When a swarm enters your hive you have no way of knowing the bees’ traits. You have strangers in your house…you have never met them before and are not sure what they are like. Will they be friendly, easily worked or vicious? Will they produce lots of honey during a nectar flow or focus on brood rearing? So, I think that we can give people figures of what a hive is capable of doing but there are too many factors involved to give them a figure of what it will do. Here are some of our more recent figures: There was an amazing nectar flow in SW Tanzania in the year 2013! 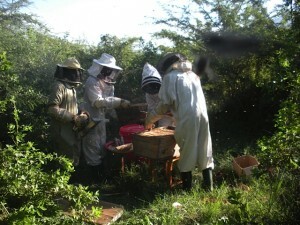 Out of the 50 top-bar transitional beehives from which we harvested in May, 46 were occupied. 23 of these hives produced 10 kilograms or more of honey. A few produced as little as 2-3 kilograms. 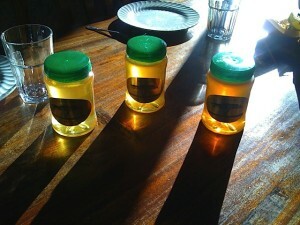 Five hives produced none but showed a strong brood chamber. Two had bees but they were very weak and looked like they had recently swarmed several times due to the many opened queen cells on the bottom of the comb. These hives varied in size but most were the size of typical top bar hive with 20-25 bars. One of the hives had a black mamba under the corrugated tin roofing attached to the lid! That was exciting. Total honeycomb collected was 1,019 pounds or 463.18 kilograms. Once the comb was pressed we were left with 700 pounds or 318.18 kilograms of liquid honey. The honey, which was water white-blonde in color, was bottled and packaged attractively with a classy sticker on the bottle and sold retail. 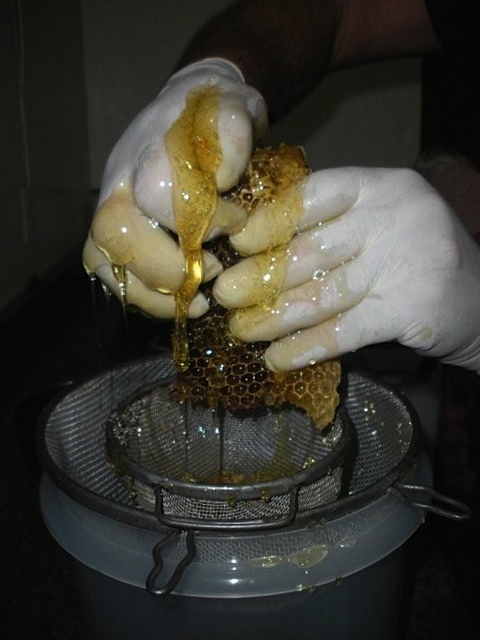 Simple and clean honey processing – no need for expensive equipment! Total income from the sales was $2,700 US dollars (Eds Note: which is a considerable amount of money in Tanzania where the average annual income per head is about $500). A rule of thumb…the lighter the color of honey the better the price and the faster it will sell. After paying for the containers, printing, labor and boxes, we were left with around $2,200 US dollars. It costs around $40 dollars to make one of our hives. We were able to pay off our 50 hives at that site, even the ones that did not produce honey, and were left with a profit of $200 dollars. However, even though we were able to pay off our hives, there was a lot of other equipment that we had to purchase to succeed in the harvesting work, such as suits, smokers, buckets of various sizes for harvesting, latex gloves, and plastic gate valves for attaching to settling buckets. "We appreciate you for this inspiring insight into beekeeping." Bashir Aniko, Nigeria. "Thanks so much for this information and inspiration to doing bee farming." Timothy Macharia, Kenya. "I believe this is a brilliant idea of doing research and communication with beekeepers in Africa." Pius Kasusya, Kenya.